Amid economic, political, and trade policy uncertainties, our credit specialists highlight their views on where the asset class stands across geographies and sectors. Although economic, political, and trade policy uncertainties remain, they have not dramatically changed over the past several months. We believe credit fundamentals are healthy and that current spreads compensate investors for unresolved risks. Though we are entering the later stages of the credit cycle and the economy is currently more vulnerable to shocks, we do not think a recession is imminent. 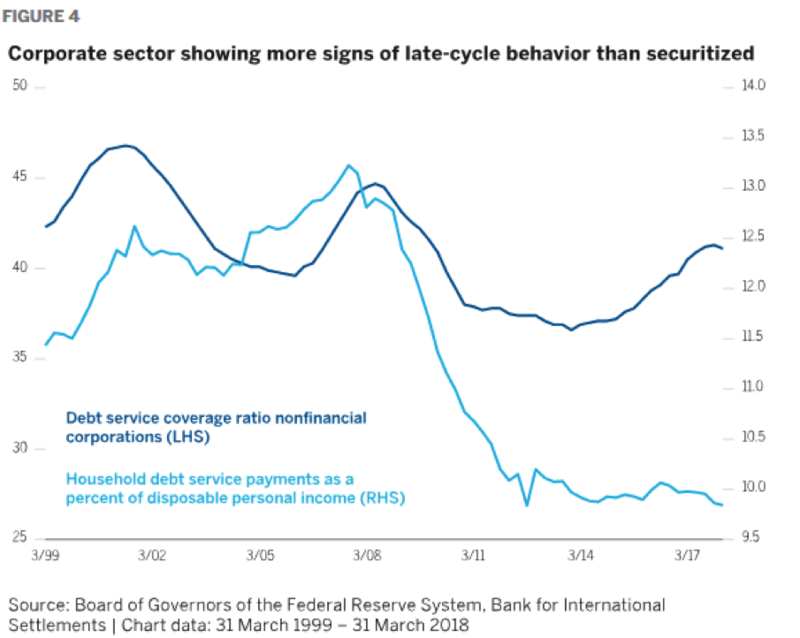 At this stage of the cycle, we feel agency mortgage-backed securities (MBS) are poised to benefit from their higher quality, while securitized credit assets tied to the U.S. housing and consumer sectors are well positioned. Corporate bonds weakened, along with many other risk assets during October and November 2018. Spreads widened on the growing belief that the economy will slow in 2019 and amid concerns about the effect of higher rates and the fading impact of fiscal stimuli on corporate fundamentals. Tighter monetary policy—both from the U.S. Federal Reserve (Fed) rate hikes and shrinking global central bank balance sheets—also contributed to the market malaise, given its potential to drain excess reserves out of the financial system and rebalance the supply and demand for credit. In addition to macro concerns, idiosyncratic issues arose, such as liabilities from recent California wildfires, company-specific events, concerns about the impact of a China slowdown and rising materials costs on the auto sector, and regulation of the tobacco sector. While some of these and other risks remain unresolved, we think current spreads fairly compensate investors for these risks and have become more constructive on credit heading into 2019. In this piece, we further explore our views on credit across geographies and sectors as the asset class moves into the later stages of the cycle. What is common across these disparate stories is that less risk appetite translates to less support for credit when issues occur. Political risks remain, including Italy’s budget, the U.K.’s impending exit from the European Union (Brexit), and ongoing U.S. trade wars. But market participants are now demanding—and receiving—a higher premium to be exposed to those risks. We do not necessarily believe that spreads will return to their tight levels of this year, but if our base case of continued economic growth continues, then we think investors will still be able to earn an attractive carry from credit markets. If some of the risk cases turn out favorably, we could see spreads tighten. Backstopping our view on credit is that current credit fundamentals appear healthy overall, although leverage is elevated for this late stage of the cycle. 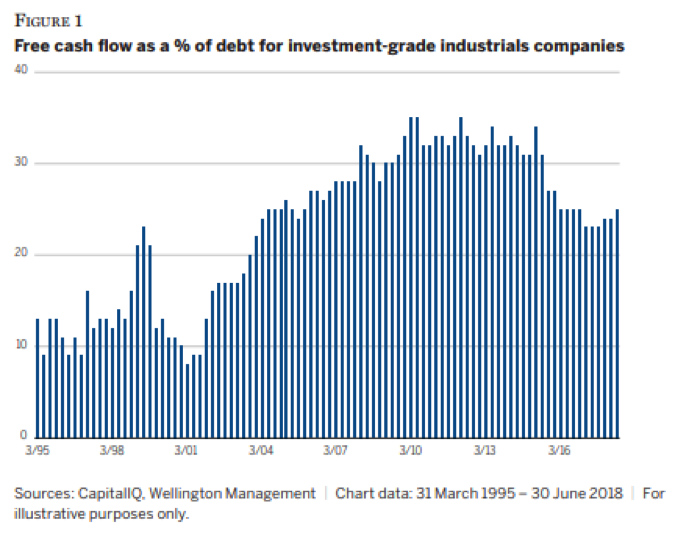 Many companies will likely be reliant on continued strong economic growth and higher earnings for deleveraging to occur, since most free cash flow has been directed to dividends and share buybacks thus far. However, these companies have the flexibility to deleverage if they shift their strong free cash flow toward debt reduction (Figure 1). While many investment-grade (IG) companies have not yet made the shift, we think as growth slows, managements will look to start protecting their balance sheets. We believe protectionism in the form of tariffs represents a negative supply shock that is likely to weigh on global growth in 2019. In our view, trade policy uncertainty, along with political risk in the United States and Europe, will also limit the economic impact of fiscal stimulus enacted earlier this year. Moreover, the midterm election results could prompt a shift away from the business-friendly policies that have contributed to revenue growth. Still, valuations of short-maturity corporate bonds look increasingly attractive, especially short-dated issues from U.S. banks. We are particularly constructive on the U.S. banking and utility sectors. We think banks are also less vulnerable to the shareholder-friendly activity that represents another source of issuer-specific volatility in the industrial sector, where active security selection will be critical. Continued political tensions in Europe highlight the enduring European Union (EU) political vulnerabilities, and have shifted the focus away from much-needed structural EU reforms. While the European Central Bank remains accommodative, and would likely act to help dampen spikes in volatility, it appears less willing to underwrite sustained political uncertainty in Italy or any other single country. Therefore, in our view, the budget process in Italy remains a near-term risk. 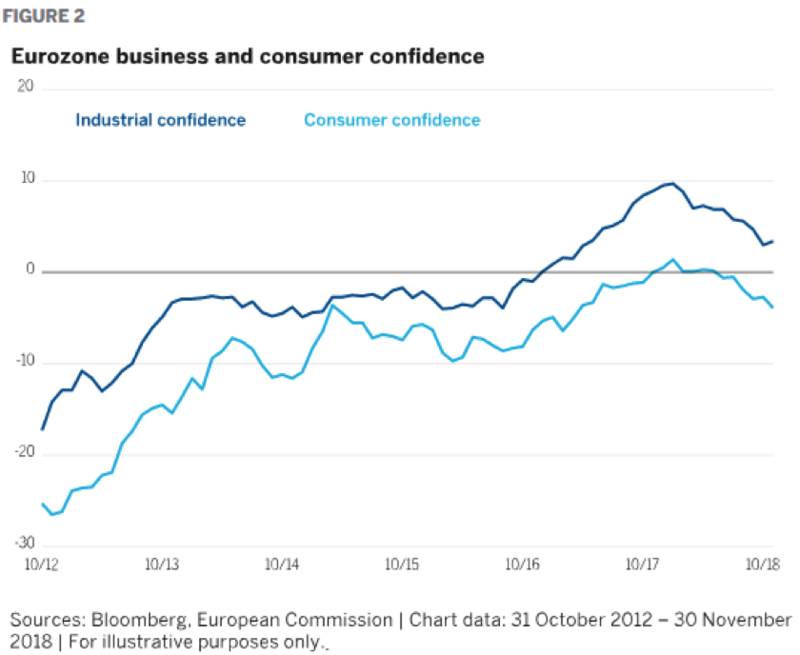 The combination of political tensions and trade policy uncertainty could undermine business and/or consumer confidence, which have already begun to decline (Figure 2). This could turn the recent loss of economic momentum into a more pronounced growth slowdown. We are more cautious on European banks given their greater fundamental and market exposure to European political uncertainty. Although most emerging markets (EM) countries have been less dependent on foreign capital for financing than in the past, we saw that those with more challenging debt dynamics, such as Argentina, Turkey, and Brazil, were exposed during the recent bout of market volatility. Broadly, EM countries are responding to pressures in an orthodox manner that protects their credit quality by allowing their currencies to depreciate. This has allowed countries to maintain ample reserves; however, it does have pass-through impacts on inflation, prompting EM central banks to raise rates. While this can act as a headwind to growth, we think EM fundamentals are starting from a point of relative strength. We believe the more countries that adopt orthodox policies, the less likely deteriorating economic conditions in these countries will cause contagion to spread, and the less likely U.S. credit fundamentals will be adversely impacted. We remain constructive on global high yield given the backdrop of stable corporate fundamentals, a supportive macroeconomic landscape, and continued demand for yield-producing assets. Spreads trade just inside their historical average following recent widening but in our view are reflective of a strong economy and solid company fundamentals. While geopolitical events and tighter-than-expected central bank monetary policy are risks, valuations appear reasonable relative to our outlook, especially given our expectation for a benign default environment over the next year. We are particularly positive on conditions in the United States and favor issuers expected to benefit from a stable or growing U.S. domestic economy. In our view, high yield maintains an attractive yield advantage, and the ongoing “search for yield,” given the low absolute levels of interest rates around much of the globe, coupled with low supply, should continue to provide a tailwind for the asset class going forward. As we enter the later stages of the credit cycle, we believe agency mortgage-backed securities have the potential to benefit from investors upgrading their portfolios and turning to higher-quality assets. While corporate fundamentals are starting to show some vulnerability to the late-stage cycle, we believe mortgage fundamentals look particularly strong. Mortgage prepayment risk is substantially lower than at any period before the crisis, since just over 80% of the market, as proxied by the Bloomberg Barclays 30-year MBS Index as of 11 December 2018, has a borrower rate below the current mortgage rate. Further, realized prepayment speeds on 30-year FNMA mortgages, for example, are the slowest they have been in 10 years as of 30 November 2018 according to eMBS. At the same time, mortgages have already extended substantially given the increase in rates. The average duration of the Bloomberg Barclay’s MBS Index has consistently been above five years in 2018, which is rare. Therefore, we think the potential for extension from further increases in rates is quite limited. From a valuation perspective, the spread on current coupon mortgages over U.S. Treasuries is sitting at five-year wides. 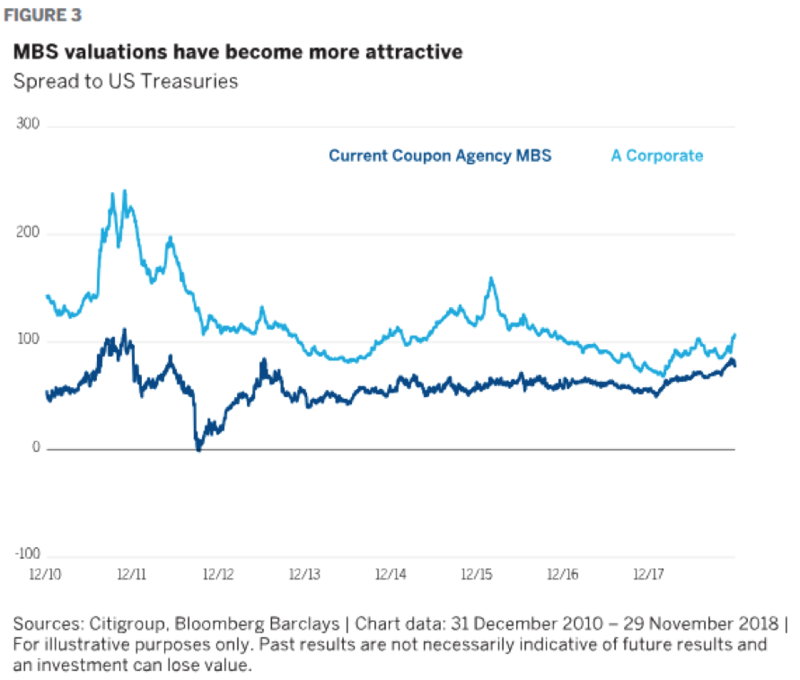 In addition, the spread difference between agency MBS and A rated corporates is near its tightest level since the crisis (Figure 3). In our view, MBS technicals have deteriorated. The Fed’s balance sheet normalization process is well underway, having steadily reduced the amount of MBS paydowns that it reinvests each quarter, though this has mostly been priced into the market. Additionally, banks, which are typically significant buyers of agency MBS, have been largely absent from the market this year, and increased demand from money managers and other relative-value investors has not been enough to fill the void. However, we appear to be past the seasonal peak in mortgage supply, which should help in the short run. Furthermore, the longer term technical picture looks even better, considering we believe the supply of U.S. Treasury debt is set to increase relative to agency MBS. Still, we do worry that the market backdrop remains choppy as the economic cycle matures and central banks tighten policy. Interest-rate volatility has risen over the last few months, but is still low by long-term standards. In our view, this suggests that the market is not pricing in a return to a volatile environment that would hurt MBS. Mortgage spreads could widen in a risk-off environment, but we would expect them to come out ahead of competing spread sectors due to their higher quality and relative stability. Additionally, many investors have been underweight agency MBS versus corporate credit as central banks injected unprecedented amounts of liquidity into the system. As loose monetary policy draws to an end, we suspect investors may look to derisk their portfolios into higher quality, more stable assets, which should benefit agency MBS. Within our agency MBS approaches, we are overweight mortgages, with a bias toward assets that we believe can generate income and provide more stable cash flows, such as Fannie Mae Delegated and Underwriting Servicing bonds and agency CMOs. Away from agency MBS, we are also constructive on securitized credit, particularly assets that are tied to the U.S. housing and consumer sectors. There has been some slowing in housing activity this year, which we deem to be a healthy response to the decline in affordability from rising rates and home prices. We expect moderating but still positive home price growth, which should continue to benefit the credit performance of post-crisis nonagency residential MBS. Additionally, we think consumer fundamentals remain in good shape—underpinned by a strong labor market and gradually rising wages. Moreover, the consumer balance sheet is strong, having delevered dramatically since the crisis, leaving consumers better positioned to meet their debt service obligations relative to corporations, which have been adding leverage (Figure 4). Within our securitized credit portfolios, we are expressing our constructive view on U.S. housing and the consumer via investments in nonagency residential mortgage-backed securities and consumer asset-backed securities. Although economic, political, and trade policy uncertainties remain, they have not dramatically changed over the past several months. Importantly, we are now receiving greater compensation for being exposed to these risks. We expect spreads to trade in a relatively narrow range as long as the economy continues to grow. If some of the political and trade concerns abate, spreads could tighten. We believe the primary risks to our credit outlook are political—both in the United States and Europe—and monetary, if rising inflationary pressure leads to more aggressive central bank policy tightening. Reductions in central bank asset purchases also increase the potential for market volatility. As investors position their portfolios for the later stages of the cycle, higher quality assets like agency MBS could benefit. We maintain a constructive outlook for credit heading into 2019 but continue to monitor signals that would indicate a turn in the cycle. FOR INFORMATIONAL PURPOSES ONLY. VIEWS EXPRESSED ARE THOSE OF THE AUTHORS, BASED ON AVAILABLE INFORMATION AND SUBJECT TO CHANGE, AND SHOULD NOT BE TAKEN AS A RECOMMENDATION OR ADVICE. INDIVIDUAL PORTFOLIO MANAGEMENT TEAMS MAY HOLD DIFFERENT VIEWS AND MAY MAKE DIFFERENT INVESTMENT DECISIONS FOR DIFFERENT CLIENTS. ANY FORWARD-LOOKING ESTIMATES OR STATEMENTS ARE SUBJECT TO CHANGE AND ACTUAL RESULTS MAY VARY.